One of my fondest foodie dreams since a conversation with my friend Renee was to own a grain mill. She told me about live grains, she had been to a presentation about the health benefits of grinding whole grains fresh. I also was concerned about how whole whole grain flour was, if the manufacturers of flour are trying to create a shelf stable product, do they include all of the whole grain in the flour? Also I wanted to try spelt but honestly, the price of spelt flour in the small bag at the grocery store was scary high. The above machine is the grain mill I decided to choose. 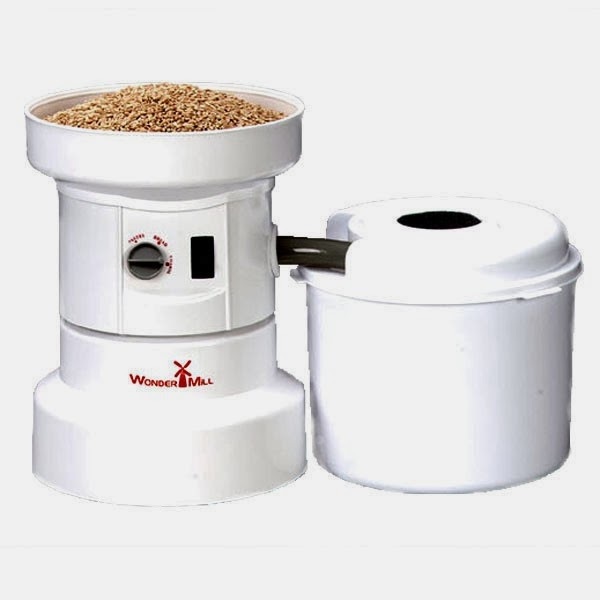 Two machines share center stage in the grain mill world, the WonderMill and the WhisperMill. While researching grain mills I read about a test done on both and the WonderMill continued grinding even after the WhisperMill motor gave out. I bought my WonderMill here. They have great reviews too, if you want or need more than my endorsement.